Imagine being able to predict the buying habits of your customers before they even visit your site. Picture being a hero to your organization, alerting department managers to sudden spikes in demand that weren’t even anticipated. Contemplate the power of being able to see around corners, and knowing where to invest budgets to drive the most value from marketing. With today’s technology and data, these aren’t pipe dreams, they are real and achievable goals. leveraging predictive marketing. The report, The Predictive Journey: 2015 Survey on Predictive Marketing Strategies, shows that predictive marketing is on most marketing agendas. The vast majority of marketing leaders (84%) intend to ramp up spending on marketing technologies and initiatives. Early-stage organizations are piloting, experimenting or launching their first efforts make up 31% of respondents. 28% of this segment plan implementations within the next six months, while nearly 50% have had efforts underway for up to a year. Advancing organizations are those who report that their predictive marketing efforts have been completed in parts of their businesses and are driving results, including 42% of respondents. Mature users of predictive analytics technology report tangible gains to their bottom lines.An overwhelming majority of executives with experience in predictive analytics (86%) indicate the technology has already delivered a positive return on investment. Predictive analytics skills are in great demand. In terms of skills sought, analytics/predictive analytics are in high demand at more than two-thirds (68%) of organizations. Measurement may improve marketing. However, measurement is the most challenging aspect in marketing, and predictive marketing, by its very nature, delivers ongoing measurements. Close to six in 10 organizations (58%) report accurately measuring marketing campaign/initiative results is one of their most difficult obstacles. Improving customer retention rates (41%) is the most common type of metric employed to measure the success of predictive marketing efforts. Overall, customer value metrics are used by 36%. Predictive analytics also plays a key role in sales and revenue forecasts, as well as risk assessments. 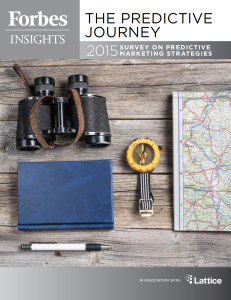 Read up on the state of predictive marketing in this in-depth report from Forbes Insights.